Requirements for registering: 21 years of age by May 13, 2019, high school diploma or GED, and not have been convicted of a felony or misdemeanor involving moral turpitude other than a minor traffic violation. The Police Department has a tattoo policy. 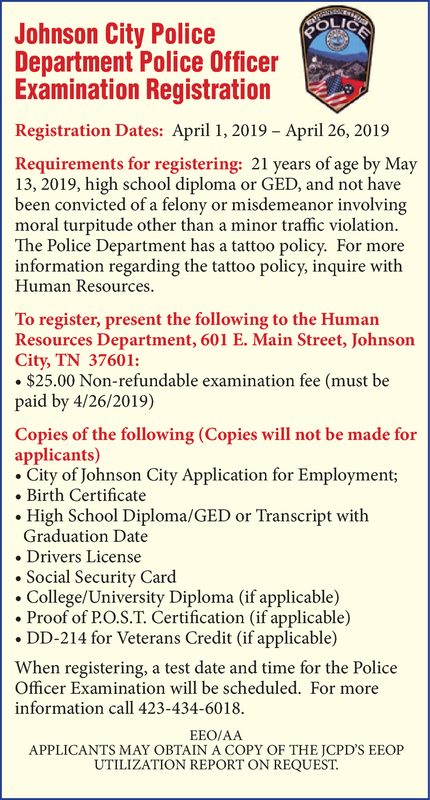 For more information regarding the tattoo policy, inquire with Human Resources. When registering, a test date and time for the Police Officer Examination will be scheduled. For more information call 423-434-6018. Applicants May Obtain A Copy Of The JCPD’s EEOP Utilization Report On Request.